This is a famous essay/lecture by one of the 20th century’s most influential philosophers. 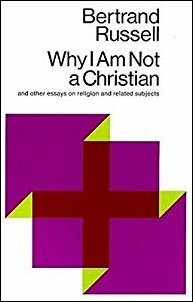 I first read the book containing this essay in 1979, when I was 23; I was thrilled to find someone so eminent unapologetically spell out the problems with faith and religion that had already becoming obvious to me. I happened to pick it up again today, and thought the essay worth recording and responding to, with some understanding of intellectual advances since this lecture was delivered in 1927. These arguments about the existence of God, and the mixed record of religion as a positive or negative force in the world, are not new. The so-called “new atheists” of the first decade of the 21st century – Sam Harris, Daniel Dennett, Christopher Hitchens, Richard Dawkins – became well-known because society had changed in the century since Russell, becoming more multicultural, more accepting of alternate ideas, and more influenced by the effects of science and technology, which (unlike religion) truly have changed the world, mostly for the better — and so much more receptive to the revealing of their insights about the archaic effects of religion. So here’s my summary/paraphrase of Russell’s famous 1927 lecture. My comments are in [[ dark red brackets ]]. Page references are to the Touchstone paperback edition of the book, https://www.amazon.com/Christian-Essays-Religion-Related-Subjects/dp/0671203231/, still the current edition in print, as shown here. To say one is a Christian – which used to have a much narrower, tighter meaning – these days [remember he’s speaking in 1927], means believing in God and immortality, and having some notion that Jesus was the best and wisest man in all of history. First, about belief in God. Traditional arguments claim proof of God through mere reason. But these arguments are easily refuted. First-cause argument. Russell’s response: First, why must the universe have a beginning? And if it did and God got things going, where did God come from? So, does good and evil exist only because of God? If so, then to God, there is no difference, and his distinction is arbitrary; if there were an actual distinction, one wouldn’t need God to distinguish them. “Turn the other cheek…” Not a new idea; Lao-tse and Buddha said it before him. And most Christians would hardly do so anyway. Similarly with ‘judge not lest…’ and ‘If thou wilt be perfect, go and sell that thou hast, and give to the poor’, which Christians noticeably do not practice. Christ [it’s notable that this essay uses the name Jesus exactly once; otherwise it’s about Christ] insists on his ‘second coming,’ over and over, within the lives of those he preached to. The moral problem: Christ believed in Hell, everlasting torment, which author cannot respect. And Christ responded with “vindictive fury” against those who would not listen to his preaching – an attitude similar to that of fire-and-brimstone preachers today, but not to the attitudes of other wise men in history, say, Socrates. Christ’s comments about sin and the Holy Ghost and everlasting fire and gnashing of teeth have caused much misery throughout history, by making people terrified of everlasting torment for slight errors of thought. Christ’s was a doctrine of cruelty. Russell finds Buddha and Socrates more worthy of respect than Christ. Still, author understands that people accept religion on emotional grounds. It’s often argued that religion makes men virtuous. In Samuel Butler’s Erewhon Revisited, a man returns to a primitive remote country many years after his first visit, to discover the locals now venerate him as a god. When he insists he is not, they urge him to remain quiet, lest the country turn wicked without its worship of him. Author notes the “curious fact, that the more intense has been the religion of any period and the more profound has been the dogmatic belief, the greater has been the cruelty and the worse has been the state of affairs.” P20.6. Thus the Inquisitions, the burning of witches, and so on. In contrast, “You find as you look around the world that every single bit of progress in human feelings, every improvement in the criminal law, every step toward the diminution of war, every step toward better treatment of the colored races, or every mitigations of slavery, every moral progress that there has been in the world, has been consistently opposed by the organized churches of the world.” P20-21. Russell goes on about fear: “Religion is based, I think, primarily and mainly upon fear. It is partly the terror of the unknown and partly, as I have said, the wish to feel that you have a kind of elder brother who will stand by you in all your troubles and disputes.” P22. This entry was posted in Book Notes, Philosophy, Religion, Science. Bookmark the permalink.